When it comes to travel, there are some awesome sites to behold on the face of this planet. What many don’t get to see, however, are the wonders to behold under the surface of the deep blue ocean. We’ve outlined some of the mysterious sites that lurk in the deepest parts of the earth’s oceans before, but today we’re going to peel off yet another layer and show you some of the greatest wrecks around the world available for diving. Fancy a little SCUBA trip? Make sure you include one of these on your next adventure. Chuuk Lagoon, commonly known as Truk Lagoon, is a naturally sheltered body of water situated within the Federated States of Micronesia. This is we believe the world’s ultimate wreck diving location. It contains more than 60 wrecks including Japanese supply vessels (Maru), WWII aeroplanes, tanks, bulldozers and railroad cars. This amazing collection of wrecks, often referred to as the ‘Ghost Fleet of Truk Lagoon’, came as a result of the Japanese Imperial Fleet, which was based at Truk, being destroyed by a US led ‘Operation Hailstone’ naval airstrike in 1944. The majority of the wrecks are located around the islands of Dublon, Eten, Fefan and Uman where they rest virtually intact. With the crystal clear waters in this area, people can see them simply by going snorkelling but the real joy is to throw on your scuba gear and get down there. Littered across the ships’ decks you will find historical artifacts such as guns, gas masks, torpedoes, mines, radios, medicine bottles, etc and below deck there is plenty of evidence of human remains. 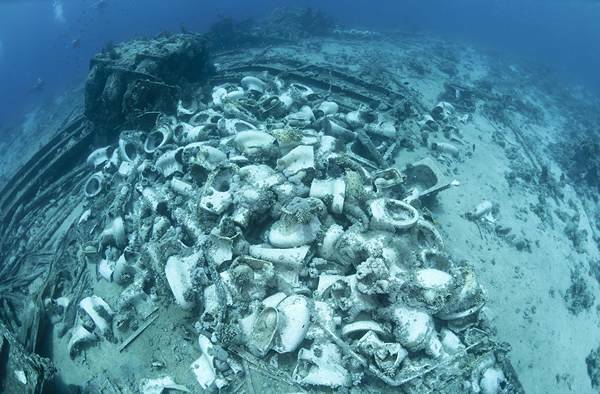 Although the wrecks today are encrusted with a variety of corals, it is still possible to clearly define mounted guns, steering columns, vehicle wheels and so much more. If you only go diving once in your life, then we believe this is the place where you have to do it! Another casualty from the horrors of WWII, the SS Thistlegrom, provides us with the next wreck diving site which is located in the Gulf of Suez in Egypt’s Red Sea. SS Thistlegorm was a British armed Merchant Navy vessel. Her final voyage saw her depart from Glasgow in June 1941 with her destination Alexandria, Egypt. As the Germans and Italians were showing a heavy presence in the Mediterranean Sea at the time, SS Thislegorm was forced to sail around South Africa and head up into the Red Sea via Africa’s east coast. As bad luck would have it, an accident on the Suez Canal meant that SS Thistlegorm was unable to progress through the canal to the port of Alexandria and so was forced to moor up at Safe Anchorage F in September 1941. This was the location where she remained until October 6th when the Luftwaffe decided to pay her an unwanted visit. They dropped a couple of bombs on to SS Thistlegorm both of which struck near the ship’s stern with one landing atop the ammo store hold. The bombs and the resulting explosions from the ammunition store ultimately caused her sinking. Her final resting place on the sea bed in the Gulf of Suez is only 30 metres at its deepest point so this wreck is an absolute must for all divers as there is no need to use specialist equipment such as nitrox tanks. Due to the vast explosions, the Thislegorm has some hefty chunks blown out of her which is a paradise for divers as it gives them easy access to get inside and have a good look around. Down there you will find plenty of trucks, motorcycles, rifles and wellington boots. There are also tailplanes which were for the Bristol Blenheim bombers stationed in Egypt at the time, steam locomotives and Universal Carrier amoured vehicles. Just like Chuuk Lagoon, this is basically an underwater WWII museum which sadly is showing signs of disintegration due to rust and of course mankind trampling about in the form of the wreck diving boats which were mooring themselves to weaker sections of the vessel and thus ripping her apart. We dive off to Bali now (pun intended) to pay a visit to Tulamben where the USS Liberty is laying at rest. She was a US Army cargo ship operating in World War 2 until a Japanese submarine torpedoed her in January 1942 near the Lombok Strait. Two allied vessels attempted to tow her to the harbour at Singaraja but due to taking on too much water from the damage she had sustained she was beached just off the coast at Tulamben. She remained visible for all to see until the volcanic eruption of Mount Agung in 1963 moved the vessel off the beach to a sand slope in 10 to 30 metres of water where she has remained since. Due to her close proximity to land, divers are able to access her directly from the beach where they swim out before getting their masks on and going under for a closer look. The shallowest part of the dive is only 5 metres with the deepest point being around 30-35 metres. As she was beached, most of her heavy cargo was salvaged so there isn’t too much to see in that respect but do not let that deter you. There is still a rather nice 6-inch gun and some rail track profiles which are covered in some delightful coral with some amazingly colourful fish swimming throughout the wreck. This really is one of the world’s best wreck dives and that is evident by the amount of divers who go out to visit her every day. If you ever do plan to dive this wreck, get there early because by mid morning it is normally full to the brim of fellow SCUBA divers all wanting to get a look at this piece of history under the waves. Many people say this is the best wreck dive in the world. Full stop! Of course, it’s all a matter of opinion and I prefer Chuuk Lagoon personally but that doesn’t mean to say this is not an expectional wreck because it most certainly is. The SS Yongala was a passenger and freight steamer. She sank off the coast of Queensland, Australia way back in 1911 as a result of steaming into a tropical cyclone, killing all 122 on-board. The 110-metre steamer lies in about 30-35 metres of water on a sandy base. The highest point of the SS Yongala wreck is at around 15 metres below the surface. Unlike some of the previously mentioned wreck dives, this is one for the more seasoned SCUBA people because going below 30 metres takes you into deep dive territory and also there is a strong current in the area which can cause problems if you aren’t experienced enough. The SS Yongala wreck is now protected and entry inside her is forbidden but there is still plenty to see such as masts, old toilets and numerous other goodies. The marine life is something very special in this area with giant groupers and Manta Rays often floating on by. There are also many sea turtles, sea snakes, monstrous schools of Barracudas and a variety of sharks including the rare Bull Shark. To round things off, the variation in the different types of hard and soft coral formations is absolutely splendid and its rich colours make this wreck dive site the complete package and one which can only be believed by actually getting down there and seeing it. A certain must dive location, no doubt about it. Every cloud has a silver lining so the saying goes. On this ocassion, the cloud in question is the MS Zenobia, a Challenger-class Roll-on Roll-off ferry, which capsized and sank just off the coast at Larnaca in Cyprus in 1980 taking her estimated $300 million worth of cargo with her. The silver lining from all of this; firstly there was no loss of life and secondly it has provided arguably one of the best wreck diving sites in the Northern hemisphere. There is something for everyone when diving this wreck. Newly qualified divers can explore the 172-metre ship’s starboard side which is 16 metres below sea level while those who are qualified to do deep dives can check out the accomodation blocks, upper and lower car decks, the ship’s engine room, the cafeteria, anchor and her two giant propellers. The sea bed is 42 metres below, and there you will see several lorries and a full cargo of eggs which slid off when she capsized. The wreck is now home to some wonderful marine life such as Barracudas, Jacks and Groupers which adds even more value to the site. Due to the Zenobia’s size, you really need to dive her several times so you can have a good look around at all she has to offer. Jumping back to the Pacific now to the island of Espiritu Santo in Vanuatu were the SS President Coolidge now lies at rest. She was a luxury US ocean liner but during WWII, she was called into service to assist in the evacuation of US citizens from Hong Kong and various other locations under threat from Japanese forces. She was sunk my ‘friendly’ mines while attempting to enter the harbour at Santo and now rests on her port side with her bow at a depth of 21 metres and her stern way down at 73 metres. This wreck is so big that you could dive it 20 times and you still wouldn’t get to see all of her, and as most of the dives are over 30 metres, decomp. stops are necessary, however, these are made on the coral gardens which give all dives a wonderful chance to examine the different coral varieties and superb marine life around the Coolidge. There really is so much to see on the Coolidge and we can assure you that you won’t be disappointed if ever you get to go and dive her. A definite must for any serious SCUBA divers who enjoy shipwrecks. If you are living in the British Isles and are beginning to think that all the best wreck dives are thousands of miles away, then it’s time to pay attention. Just to the north of bonny Scotland in the Orkney you will find the wrecks of 7 WWI German High Seas vessels in Scapa Flow. Based purely on its historical value, this site can argue a fine case for being the most awesome wreck dive location in the world. We have Rear Admiral Ludwig von Reuter to thank for this amazing collection we can see today as it was he who gave the order for the three battleships, three light cruisers and one mine layer to be scuttled rather than letting them be seized by the British in 1919. All seven ships, their names; SMS Coln, SMS Karlsruhe, SMS Brummer, SMS Kronprinz Wilhelm, SMS Markgraf and the SMS Konig lie in depths ranging from 12 to 45 metres so there is something for every level of diver. There are so many different dives you can do in Scapa Flow that it would take all day (and then some) to write them all down such is the variety of these sunken gems. The only downside to this treasure trove is the weather in Orkney which only allows for good diving conditions for four/five months a year ( May to September). An ABSOLUTE must dive site! Off to the Bay of Brunei now to the Malaysian island of Labuan where another four amazing shipwrecks can be explored. The American Wreck is the USS Solute which was a minesweeper now rests 24 kilometres from Labuan. She struck a mine and sank and now lies at 33 metres on a sandy bottom with tangled masses of metal and cable all over the place. Highlights include depth chargers, ammunition shells, shoes, bottles and guns which can all be seen scattered around the wreck. She is now home to many fish-cleaning stations so the marine life in addition to the wreck itself is something truly special and well worth a visit. Although not an Australian ship, the next wreck was named The Australian Wreck as she was sunk by Australian aircraft during WWII. Now resting about one mile from the American wreck, she was a Dutch merchant vessel that had been seized by the Japanese and fitted with weapons. At over 100 metres in length and at 21 metres at her shallowest point, she offers some wonderful diving for everyone. A particular feature of the wreck is the presence of resident palm-sized frogfish or anglerfish. Large groupers can be seen swimming about looking for an easy feed among the profusion of marine life. The Cement Wreck is a freighter which it is believed was carrying a cargo of cement (hence the name) bound for Brunei. The ship sits perfectly upright on the bottom at about 30 metres. Her masts stand at 8 metres, the roof of the wheelhouse at 14 metres. Schools of bait fish congregating in huge groups greet divers as they descend the masts of the ship. The outer parameter of the wreck is patrolled by schools of fusiliers, bat fish, barracudas and rainbow runners. 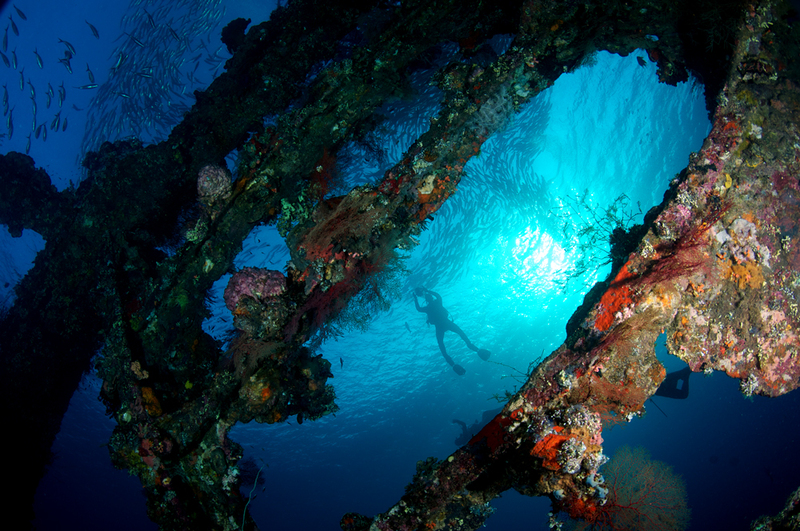 This wreck offers the avid diver the most photogenic opportunity of all the wrecks. The Blue Water Wreck is that of a trawler which caught alight and sank in 1981. She lies on her side at 34 metres and is for advanced divers and above. It is still a very interesting dive with plenty to explore and being a trawler she offers something different to most of the other wrecks we have spoken about. As with the other wrecks within the Labuan area, the marine life here is spectacular and well worth diving for that alone. All in all, an amazing variety of dive sites all situated so close to each other make this a fantastic experience. We’ll finish with the wreck that was. The Jolanda was a South African cargo ship. She came a cropper in the Red Sea and ran aground of the edge of a reef and rolled over onto her portside and sank. Although she was resting at about 20 metres, her stern was left dangling over the reef’s edge. Gradually, inch by inch, she continued to roll until one day she dropped off the ledge and slid way down in to the deep – 160 metres or thereabouts. There are still many remnants of the ship’s cargo to be found with the highlight being a BMW car which it is believed belonged to the ship’s captain. Despite the wreck no longer being there, this is still one of the best dives in the Egypt’s Sharm El Sheikh region and the marine life which can been seen while moving about exploring the ship’s spilled cargo make up in part for the Jolanda not being there as well. So what do you think? have we missed any epic dive sites? Have you been to any of the above? Let us know in the comments section.